← ABC 7:30 report – Should alternative medicines have their government rebate cut? Should pharmacists stock homeopathic products? There has been recent debate in AusPharmList about this topic which has also involved a discussion of their regulation. Currently, any homoeopathic preparation that is more dilute than a one thousand fold dilution of a mother tincture (i.e. 4x or greater), and is not required to be sterile, is exempt from TGA GMP requirements and also from listing on the Australian Register of Therapeutic Goods (ARTG). The historical basis for these exemptions dates back to the development and implementation of the current Regulations, when it was considered that homoeopathic preparations did not present a significant health risk to the general public, and hence minimal regulation was appropriate. However, this has meant that homeopathic products are not subject to the same level of post-market scrutiny that applies to other low risk medicines. Exemption from TGA regulation has seen the marketing of purported homeopathic products such as homeopathic somatropin and homeopathic melatonin and marketing claims that are inconsistent with TGA evidence guidelines (a homeopathic product may claim that it is in accord with the homeopathic tradition (if it is) but this cannot and should not be converted to a claim for efficacy). Increased regulation of homeopathic products (and better public education) has been proposed by numerous expert committees since 2003. It has yet to eventuate despite a TGA paper recommending specific changes in 2008. Most recently, the TGA have said they are awaiting the final NHMRC report on homeopathy (the draft report was released for public consultation from 9 April to 2 June 2014). The other regulatory problem is the TGA’s lack of effective penalties for advertising claims that breach the Therapeutic Goods Advertising Code. Companies often refuse to comply with “requests” by the Complaint Resolution Panel (CRP) for removal of claims (and the publication of retractions) when complaints have been upheld. The CRP then refers these complaints to the TGA who conduct their own assessment of the complaint and, when upheld, “order” the company to comply. The company can continue to not comply. Another approach by companies is to appeal, first to the Minister and then to the AAT, a process that can take several years. Meanwhile, the offending promotion continues. The final route for complainants is to convince the ACCC to take the offender to court which takes several more years. For example, a complaint about the promotion of homeopathic immunisation first lodged in 2011 was referred to the TGA by the CRP later that year. The TGA then “ordered” a retraction (which was not complied with in 2012) where upon a complaint was sent to the ACCC who finally got a Federal Court judgement in late 2015. See: http://www.medreach.com.au/?p=1215. Once again, this problem has been the subject of numerous reports over the last decade. The latest was in May 2013 in which specific recommendations were made to give the TGA more powers. Apparently this report is still being considered by government in light of their de-regulation agenda. Meanwhile, consumers continue to get taken in by these products. I remain convinced that an important role for pharmacists is to have the knowledge and the will to provide their customers with the facts about such products. Whether they should stock them is an ethical decision for individual pharmacist owners and chains and I accept that opinion on this will vary. However, a recent poll (15/04/2014) in Auspharmlist (below) appeared to show that opinion is changing. This entry was posted in Complementary medicine and tagged ACCC, CRP, homeopathic medicines, TGA, Therapeutic Goods Advertising Code. Bookmark the permalink. 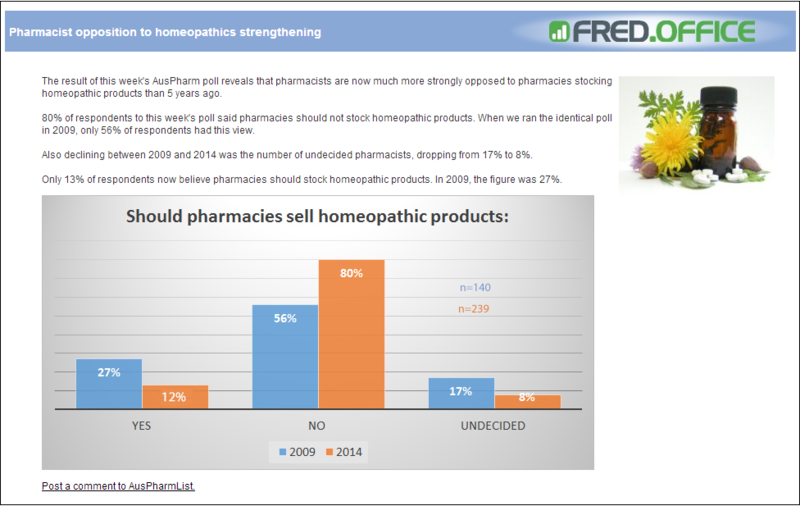 1 Response to Should pharmacists stock homeopathic products?